1. 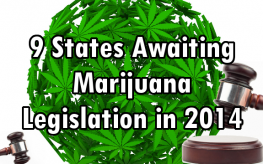 Maryland: Other than just decriminalizing marijuana (yay), there is currently a pending bill in Maryland that expands on a 2013 law to legalize medical marijuana. It would allow patients seeking marijuana as medicine better access by giving more doctors and providers access for additional purposes of treatment. 2. 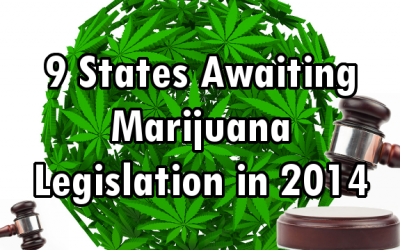 Florida: There are two bills currently pending in Florida, Senate Bill 1150, and House Bill 1139. Both are carryovers from 2013, allowing qualifying persons to poses up to 4 ounces of dried medicinal marijuana and grow up to 8 mature plants. The bills decriminalize the use of medical marijuana in these dosages. In November, Florida voters will get to decide whether medical marijuana becomes a legal, prescribable treatment option for those with serious diseases or conditions. 3. Kentucky: The Kentucky State Senate has already unanimously passed a bill which will allow cannabis oil to treat children who have been diagnosed with epilepsy. Senator Julie Denton said, “This was one of those tingly moments you get when you pass a bill that you really know is good for the commonwealth. It is really going to help people’s lives.” CBD is a component of cannabis, but doesn’t cause users to get high. About a dozen states have considered legislation seeking to allow use of cannabidiol oil for patients who have seizures. Read: Why is Marijuana Illegal? 5. Ohio: Cinncinati.com reports that “Eighty-seven percent of Ohio voters believe medical marijuana use under the care of a doctor should be legal, according to a poll [recently] released.” Supporters of legalizing medical marijuana have gathered only 50,000 of the more than 385,000 required signatures they need by July 2 to put an issue on the ballot in 2014. They need donations, though. It is estimated that it can cost as much as $10.5 million to gather the signatures and run a campaign, but say they have only received about $50,000 in donations thus far. You can make tax deductible gifts at numerous organizations that help push this issue before Senate and House committees and also help to gather signatures. 6. Pennsylvania: This state currently has a bill with unthinkable bi-partisan support to pass medical marijuana. You can visit this Facebook page to help promote the legalization of cannabis in Pennsylvania this year. A conservative Republican actually authored the bill, changing his mind about the medicinal plant after being diagnosed with non-Hodgkins lymphoma in 2012, and realizing cannabis might help him. 7. New York: Gov. Andrew M. Cuomo and state lawmakers face the important question of legalizing pot in the second half of the 2014 legislative session, with proponents hoping to make New York the next state to support medical marijuana by decriminalization. One hurdle is Sen. Phil Boyle (R-Bay Shore), and others pushing for a another alternative: legalizing oils derived from marijuana but prohibiting dispensing medical marijuana in a smokable format. It should be noted that Cuomo is looking at a 2016 Presidential run, and Boyle is not. You can contact Senator Boyle and tell him that all forms of medical marijuana should be legalized, here. 8. West Virgina: For the fourth year in a row, Del. Mike Manypenny (D-Taylor) introduced effective legislation that would have legalized marijuana for medical use in West Virginia. HB 4264 had nine cosponsors (the maximum number allowed), but it was not given a hearing in the House Committee on Health and Human Resources. The proposed law would allow people with ‘debilitating medical conditions” to posses up to six ounces or grow up to 24 marijuana plants to treat such conditions. 9. Wisconsin: Currently, there is a petition on Change.org to chastise the Wisconsin Medical Society (pushers of pharmaceutical drugs) and Dr. Michael M. Miller, M.D., F.A.S.A.M, for obstructing the legalization of marijuana in Wisconsin. Even CNN chief medical correspondent Dr. Sanjay Gupta recently formally apologized for his role in denying the legitimacy of medical marijuana, and Wisconsin county has already voted for its legalization. Let’s hope pot use for medicinal purposes still passes in Wisconsin state since the county comprises more than half a million people and is the second most-populous county there. Breaking up the legalization fight into a states’ right decision is a classic ‘divide and conquer’ move, designed to split up a power base into tiny, weak parts and ensure that no change occurs. We need to change the game and attack our federal leaders with the factual proof of marijuana’s biological mechanism as a drug. Anyone who supports the continued illegal status of the antidote for chronic disease must then also support the extermination of millions of American citizens. THAT IS A FACT. Please post the article I sent this website with the proof.